1899: 1. Olive Goodman Carpenter Johnson (daughter of Rose); 2. Gertrude Carpenter Cooper (daughter of Olive); 3. Harvey Goodman (son of Rose); Rose E. Ludwick Goodman Langan. Photo courtesy of Joe D. Valcik, www.findagrave.com, #108678000. *From the Sept. 1925 Daily Ardmoreite (Ardmore, Carter Co., OK) in a series of short articles about old settlers of the Chickasaw Nation. Complete article series in the newspaper archives of the Oklahoma Historical Society in Oklahoma City and the Chickasaw Regional Library System headquarters in Ardmore, Oklahoma. Jack went to Oklahoma Indian Territory in about 1895 and was there illegally. Therefore he was an “intruder” meaning he was not in the military, not a government official and above all not an Indian. Jack soon divorced his wife, Rose Ludwick from Concord, NC and married a young Indian girl, Lizzie Lewis. Daily Concord Standard (Concord, NC), August 25, 1898, p. 3. Mrs. Jackson Goodman has returned to her home at Pauls Valley, Ind. Ter., afer spending several months in our county. Mrs. Goodman is a sister of Mrs. Wm. H. Blume. Post in Memories of Mont Amoena Facebook group page, 31 Jul 2018. The interesting life of Rose Elizabeth Ludwick (attended Mont Amoena in 1870). Rose was the first cousin of the beloved Mt. Pleasant Civil War veteran, educator and musician, H. T. J. Ludwig/Ludwick. In 1877, Rose married Jackson “Jack” General Goodman (yes, his middle name was “General”) in Rowan County. Jack was apparently restless and wanted to move west. 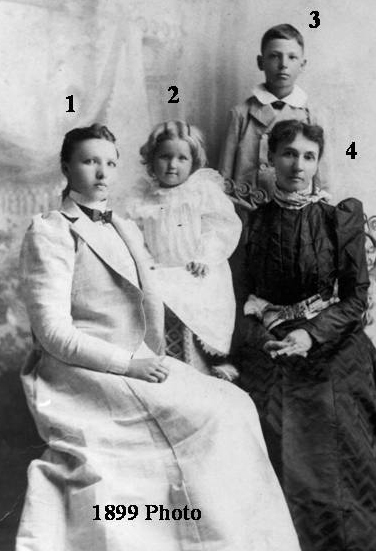 They first landed in Texas, where their two children, Olive (1878) and Harvey (1889) were born. In the early 1890s, they headed further north to Oklahoma and settled on a farm in Pooleville, Carter County (which is in the middle of nowhere), about 90 miles south of Oklahoma City. Oklahoma was not yet a state (1907), but “Indian Territory.” About the time they arrived, Pooleville became renown as the place were Bill Dalton, the bank/train/stagecoach robbing leader of the Wild Bunch gang, was gunned down in 1894. In 1897, Jack was included on a list of those who were claiming citizenship to the Cherokee nation. Under the rules of the Dawes Commission, tribal lands were to be divided among citizens of the “Five Civilized Tribes.” The Cherokee nation contested those on the list who wanted to illegally claim citizenship and land. Jack dumped Rose for an Indian woman by the name of Elizabeth Lewis, 24 years her junior. Rose made a trip back to North Carolina and stayed several months the summer of 1898. She returned to Oklahoma in August and moved to the town of Ardmore, the Carter County seat. In 1903, Rose married James Langan, but their union did not last. They divorced in 1907. Rose had a house in Ardimore from which she rented rooms. Interestingly, she was always identified in the Ardmore City Directories as Mrs. R. E. Langon, single, or widowed. Her son, Harvey, died in the hospital in 1914, leaving a wife, Mona, and 2 children. Mona remarried and the two children were living with Rose in 1920. Rose died in 1927 at the age of 70 and is buried in Pooleville.